Want to see a dog or cat licking your computer screen in trying to keep it wet and clean? 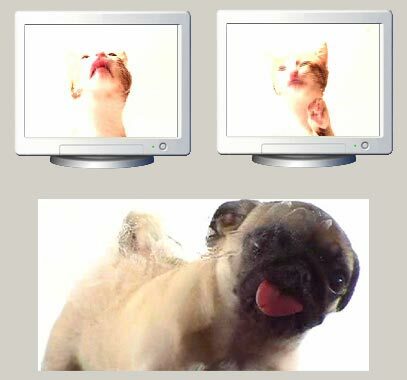 If you love cats or dogs or both – then grab screen lick screensaver in which a cat / dog keeps licking your computer screen. It cool, funny and very clean looking (duh!). From now on, your computer screen will never look dirty. Screensaver cat and dog will keep its sparkling clean. Download cat screensaver – dog screensaver [weblink]. If you don’t like animals and want little human look characters, checkout Vodafone ZooZOo wallpapers and screensaver. Oh yes, don’t forget to go to ‘Monitor settings’ and select it! Download (bitcomet) find file and double click icon. DUN. Saw this in computer shop and thought it was the owners dog!!! please send screensaver to dis mail ID.